"Largely, this price is because of the huge statistical discrepancy between the duo on hard court, with Djokovic enjoying around a 4% hold percentage edge on serve across the last 6-12 months, and around a 14% advantage on return." Unsurprisingly, Rafa Nadal eased past Stefanos Tsitsipas last night, with my assertion that Tstisipas would need to address his woeful service data from previous head to head matches proving pretty accurate. Unfortunately for the Greek prospect, he was unable to, winning a mere 54% of service points during the match - very similar to his 55% which he had accumulated across their two previous meetings. On the flip side, Nadal won 80% of service points, and 63% of points during the match, and the Spaniard continues his superb tournament so far, reaching the final without dropping a set. This is more than Novak Djokovic can boast, with the Serb winning in four sets against both Denis Shapovalov and Daniil Medvedev. With Nadal's progress into the final assured, Djokovic no longer is market favourite for the tournament on the Exchange, being priced at [2.10] to win the event at the time of writing. This means that Nadal is a [1.94] favourite - having traded as high as [13.0] during the tournament - implying that the market will find it very difficult to split the duo in the dream final on Sunday. Djokovic's opponent tomorrow, Lucas Pouille, is a huge [70.0] underdog to lift the trophy. Pouille is a huge [12.50] underdog just to make the final, with Djokovic priced at just [1.08] to progress. My model has Djokovic at [1.11] to get the win, so largely agrees with this market pricing. Largely, this price is because of the huge statistical discrepancy between the duo on hard court, with Djokovic enjoying around a 4% hold percentage edge on serve across the last 6-12 months, and around a 14% advantage on return. 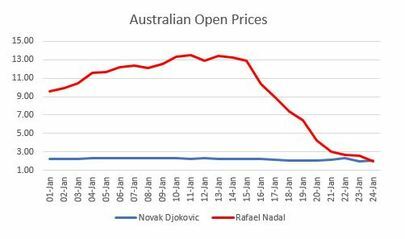 With this gigantic difference on return having huge impact in my pricing, there really is no doubt that Djokovic should be an overwhelming market favourite. Having said this, it isn't beyond doubt that Pouille can compete in the match, and give a good account of himself. He's played six matches as a very heavy underdog ([6.50]+) in Grand Slams, and has actually won the last two - against Milos Raonic on Wednesday here in Melbourne, and in the last 16 of the US Open in 2016 where he knocked out Rafa Nadal in a final set tie-break. Pouille's older price-range losses were more straightforward, winning just one set across those four encounters - against Kevin Anderson at Wimbledon 2015 - but he's shown that he has the capability of performing competently against top players, and for the sake of the neutral tomorrow, I hope that he can. 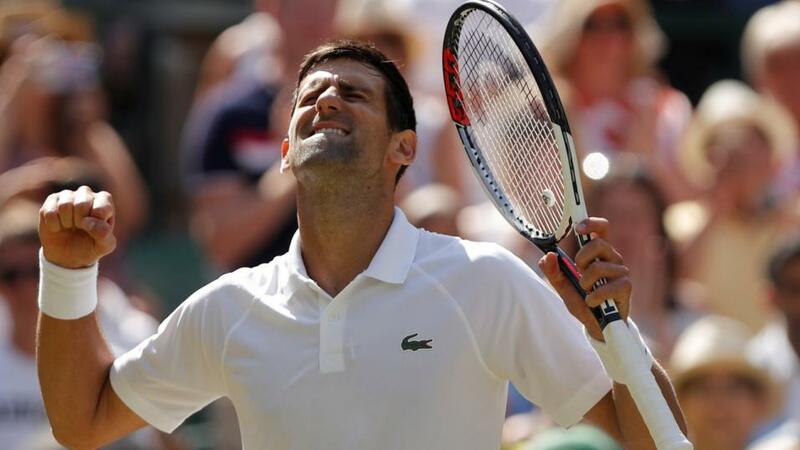 However, with the market accurately pricing up the chances of the two players, that's probably the most interest that I will have in the match - as a neutral - although I would prefer Djokovic to make it through to a highly competitive final on Sunday against Nadal. Offer available on all Singles Women’s and Men’s Semi-finals and Finals. First #Oddsonthat bet qualifies. Terms and conditions apply, click here for full details.